The website hit the most sensitive nerve of the Greek society. That of the thousands of young and middle aged men and women suffering from one of the biggest problems caused by the economic crisis, the over taxation and the recession: unemployment. I am 55 years old and thinking , my future is grim and uncertain. I am without job since two years. No matter how many CVs I sent, I got not one answer. Since one year, I receive no jobless allowance, there is nothing I can give to my child. Tell me, what we, the 55-year-old, should do? We feel like children of a lesser God. Not even pension we’ll ever receive. Prompt was the respond of jobless Greeks who used this opportunity to share with others their experiences and thoughts. It was launched on April 4th 2013 and the stories keep being uploaded with a fast speed. They offered me the astronomic salary of 490 euro net, with working hours: mo-wed-sat 9am-4pm and tue-thu-fr 9am-9 pm. A total 54 hours per week, of course without any bonuses or allowances, “because they have been cancelled,” as they told us. I suppose young people still living at home can come along with 490 euro per month. But if you live alone as I do, the money is not enough. With this logic we will end up to work for 150 euro per month and 3-4 families to have to live together in a home in order to cover up our expenses. Whether with family or not, whether young or old, the problem of unemployment forces many people into despair. Every passing day, I feel nothing has a meaning, I’m under pressure to smile, I’m fed up with my miserable nature. My parents are concern and react badly, because they don’t know how to handle a person, they cannot support forever, but also because they see I have no lust to live. I’m fed up of being unable to find a job. I’m fed up to need money for everything I want to do for myself. “Everything will go well,” I hear. Are people not fed up to say such a thing, while they know the opposite is valid? I’m 20 years old and I feel I’m 70. Rena, 20, without job since 3 years. One of the problems jobless often experience is over qualification. But also working for peanuts for a salary or struggling to stay on the surface in a lake of threatening feelings. Jobless with 3 degrees, disability rate 80%, with serious health problem, no children, with husband still having a work. Six months without job, desperation has not become my friend yet, but it dangerously comes closer. When they did not extend my contract, I cried. When they fired 800 people I was pleased because I wasn’t alone. Some friends have work and I feel I’m drowning. I get no answer from job vacancies. What should I do? Hide my studies so they can feel better? Work like a dog for some bread crumbs, or receive the bread-crumb allowance? Controversial and weird thoughts. On one side I want to come out and scream and on the other side I make some attempts to do create something and sell it so I can add [to household cost]. The couch in my arms, I dive in the internet in an effort to take a breath. Dimitris, 45, jobless since 10 months, wife without job, two kids. “I have been begging for jobs, but hind nothing,” he notes. The family lives together with the granny. In fact, they depend on the granny’s pension to come along. : 500 euro per month. “For bread alone, I need 1,80 euro per day. You can’t beat the monster,” he writes. While the text of personal stories and thoughts are limited to 350 words, contributors can also upload videos, pictures or other documents. The website also provides practical information material on unemployment in Greece. Coordinator of the project is author Christoforos Kasdaglis. The online platform is being promoted by a growing number of Greek websites and blogs. The best stories may be published in a book. 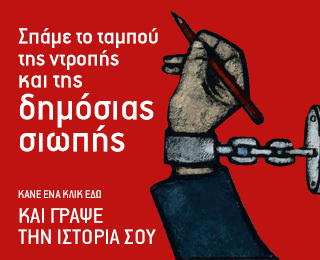 PS I think it’s a good source of real stories by real people for Greek government officials, EU commissioners and journalists around the world. Even though in Greek, the stories are short and can be easily automatically translated in English. I’m feeling so sad to read this. I feel sorry when they can’t feed their young children. Can’t Greek church start giving more as if church isn’t to help people what good is it?